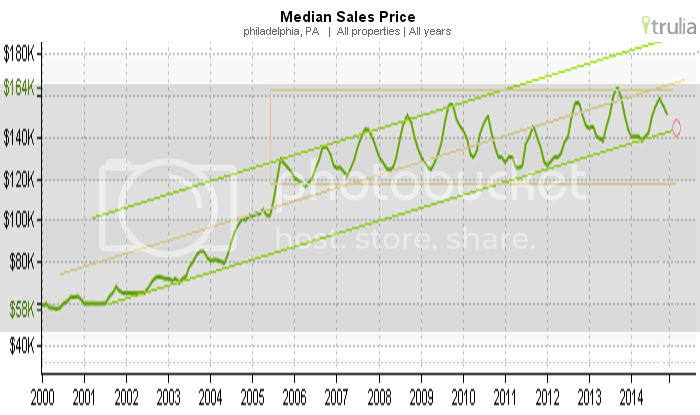 The project manager / guarantor has extensive experience and is the "largest cash buyer"
#2 : WHY PHILADELPHIA ? ?? : Background of Project Co. Some other neighborhoods are less walkable. Despite vital neighborhoods like Chinatown and Washington Square West, an outstanding transit infrastructure, and attractions like the Independence Mall and the Pennsylvania Convention Center, Philadelphia’s Market East District has never lived-up to its potential. EE&K’s plan for Market East creates a vision that is integral with strategy. One that is not dominated by one use or project, but is characterized by the diversity of forms and activities that have marked Market Street’s colorful history. It seeks to position the Market East District to play a part in a more sustainable future for the City by promoting transit ridership, leveraging the city’s existing investment in one of the richest transit hubs to be found in an American City and improving street-level air quality. The vision is based on key strategies for restoring Market Street’s role as Philadelphia’s Main Street: bringing everyone onto Market Street, focusing on places instead of projects by improving Market Street’s pedestrian environment; promoting a mix of uses; and creating a new expanded intermodal transit center. The plan also creates opportunities for Chinatown and Jefferson to expand and envisions bold new connections to the Delaware River Waterfront and the adjacent loft district. Amtrak www.amtrak.com is the American national public rail system. The trains depart from 30th Street Station and take 75-90 minutes to reach New York. There are two trains, "regular" and "Acela." The coach class fare on regular trains can be purchased for between $45 and $75 per ticket, one way, depending on the train. 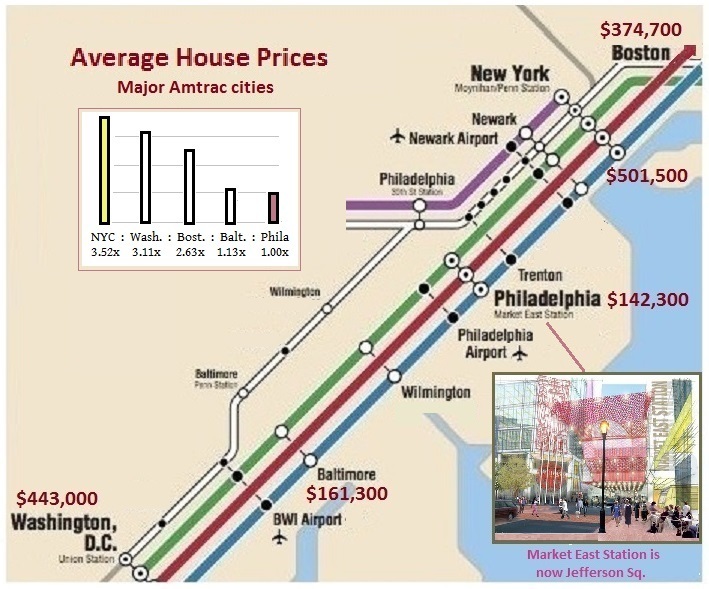 The cost of the Acela is $110-125 one way. This train is faster than the regular train and mainly used by business travelers. For non-business travelers, the extra cost of the Acela train is not worth the 10 minutes of time savings. Amtrak trains are "all reserved" which means you must have a ticket for your train in advance; seating is on a first come, first serve, basis. Check the website for discounts and "hot deals" expecially for weekend travel. Another rail option is to use the two local public transit systems: SEPTA www.septa.org and New Jersey Transit www.njtransit.com. At 30th Street again, find the NJ Transit ticket machine next to the SEPTA ticket window. Purchase a ticket from 30th Street Station to New York Penn Station (*not* Newark Penn Station). Round trip tickets are about $30. There are Senior discounts on SEPTA for those over 65 and on NJT for those over 62. Take SEPTA's Trenton train to Trenton, New Jersey. Then transfer to the NJ Transit train which is usually in front or across the platform, but not always. 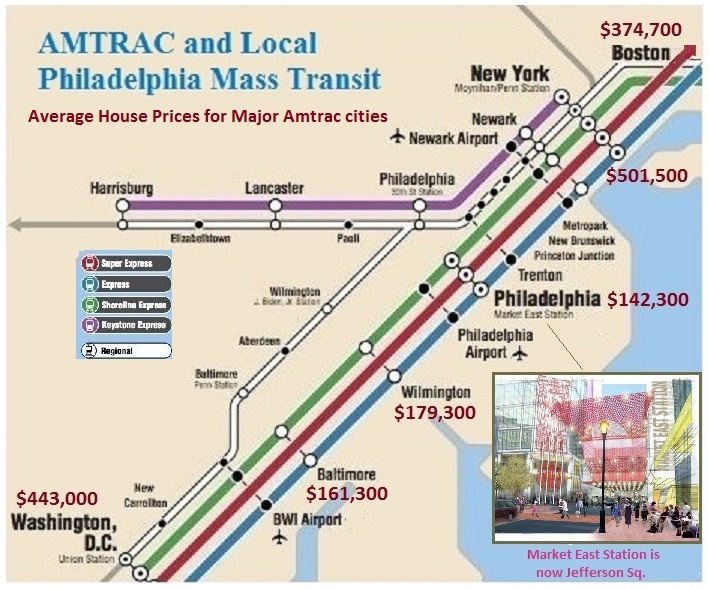 (You may want to go to www.septa.org to look at the Trenton Regional Rail Line schedule to confirm which trains connect with NJ Transit.) The whole trip is usually just over two hours, but can sometimes be as long as three hours, depending on the schedule of the NJT train. For those who don't mind the extra time and hassle of changing trains in Trenton, the savings of about $70 round trip is worth it. 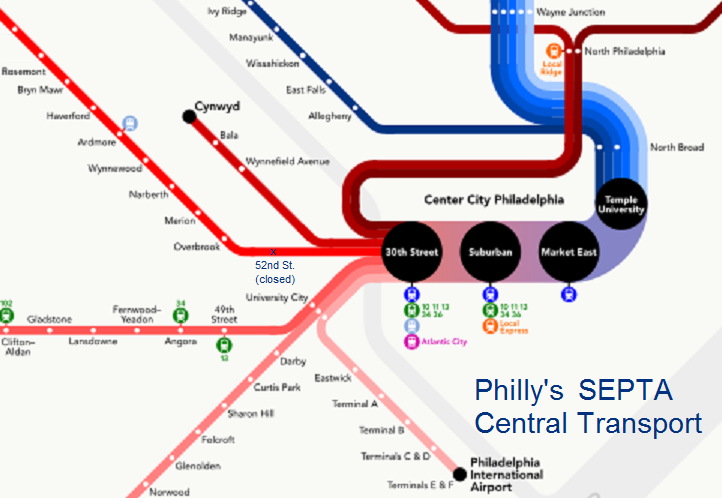 If you are staying near the airport, you may find it useful to take the SEPTA train from the airport to Center City . However, for the relatively short distance between Philadelphia and NYC of about 1.5 hours, the cheaper option is the bus. Greyhound www.greyhound.com is the largest private bus service in the country. They are located at 10th and Filbert near the Convention Center and Chinatown . They offer non-stop trips to New York as low as $34 one way online although you can purchase them at the bus depot. It's about a two-hour ride. Inexpensive bus service to NYC is also offered by Megabus and Bolt Bus https://www.boltbus.com/default.aspx. These two companies offer service to the NY Penn Station vicinity. It wouldn't be the transit agency's first foray into selling station naming-rights — and it might not be the last. 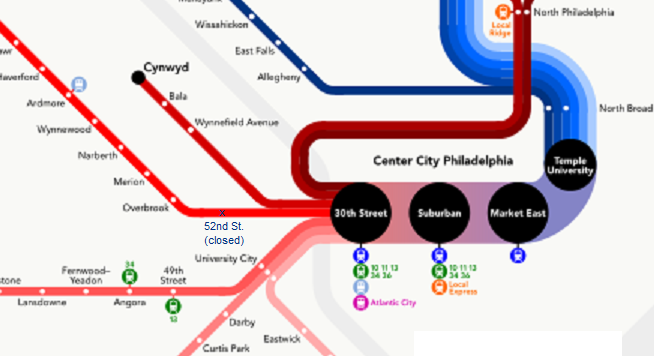 Is this SEPTA's new map? 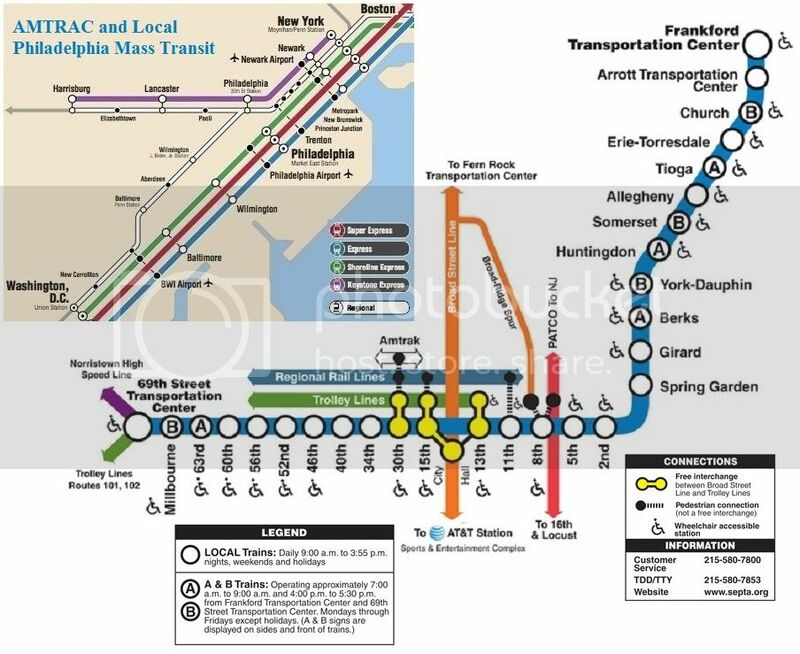 A tipster sent us the above photo of a printed-up SEPTA transit map. What’s new? Market East has been replaced with “Jefferson Station,” complete with the new logo of nearby Thomas Jefferson University. “It’s nothing we are ready or able to talk about publicly,” SEPTA spokeswoman Jerri Williams told Technical.ly Philly. It wouldn’t be the transit agency’s first foray into selling station naming-rights. And it might not be the last. “We’re definitely open to those discussions,” Williams said, adding that selling naming rights is a revenue stream benefiting SEPTA’s bottom line. A five-year, $5 million deal that turned Pattison Station into AT&T Stationnetted SEPTA $3.4 million, with the remainder going to transit advertising firm Titan, according to news reports in 2010. That deal is up for renewal next year. Of course, “Jefferson Station” could be another false alarm. Whether a deal has been finalized or these maps are merely mockups is unclear. Thomas Jefferson University Hospitals will pay $4 million for a five-year deal to put the Jefferson name on SEPTA's Market East commuter rail station in Center City. For an extra $3.4 million, Jefferson can keep the naming rights for an additional four years - a decision it will make at the end of its initial term. SEPTA will get 85 percent of the money, and its New York-based advertising agency, Titan Worldwide, will get 15 percent, officials said. The new Jefferson Station name was unveiled in ceremonies Thursday morning at the 30-year-old subterranean rail hub. Stephen Klasko, president and CEO of Thomas Jefferson University and Jefferson Health System, said the name would raise Jefferson's presence in the region and demonstrate its desire "to provide access to everyone." Jefferson, the hospital, is just two blocks south of the station. 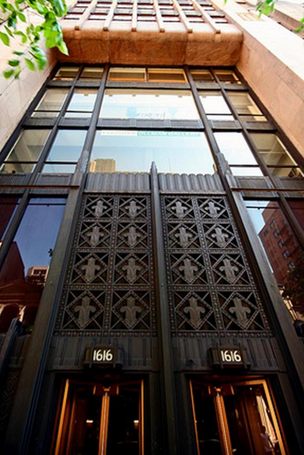 Thomas Jefferson, the person, wrote the Declaration of Independence four blocks east, at Seventh and Market Streets. His iconic silhouette is featured on the train station marquee, as it is on the hospital signs. Jefferson Health System will position shuttle buses on 10th Street between Market and Filbert Streets to transport patients from the train station to the hospital, Klasko said. SEPTA will use the Jefferson money to make customer improvements at the station, including upgrading entrances and restrooms, SEPTA assistant general manager Fran Kelly said. The Strong Towns Curbside Chat is an eye-opening presentation explaining why cities of all kinds are struggling financially and how we can work to change things for the better, one block at a time. What does productive growth look like in a 21st century city? Chuck Marohn cofounded the non-profit Strong Towns in 2009. Since then he has steadily built an audience for his message about the financial folly of car-centric planning and growth. The suburban development pattern that has prevailed since the end of World War II has resulted in what Marohn calls "the growth Ponzi scheme" -- a system that isn't viable in the long run because it cannot bring in enough revenue to cover its costs. Last year, interest in the Strong Towns message surged and Marohn, in high demand, traveled to towns and cities all over the country delivering "curbside chats" about the need to build places differently. In this Streetfilm we provide an overview of his thinking about street design, land use, and transportation funding. For more Chuck Marohn, visit the Strong Towns blog and check out their podcast. + "we can save 20%, by cutting out the Federal government's involvement in transport issues"
"It's rare. But let;s BUILD MORE of the sort of places that people want to live!" Yeah! Joe Cortright of City Observatory talks about their report -- Lost in Place -- explaining why consistent and concentrated poverty -- not gentrification -- is America's biggest urban challenge. The Buyer makes a purchase, agreeing to pay (for instance) $70,000 for a specific property from the inventory of ABC Corp*, the Vendor. This payment is satisfied by an immediate down payment of $5K, and then within 10 business days, the rest of the money ($65k) is paid. The property Title will be put in the name of a single purpose Limited Liability Company (herein called BLLC, for Buyer's LLC.) BLLC will be established at the cost of the Vendor, and the Buyer will have full 100% control of BLLC. The ongoing costs of running BLLC, including accounting costs will be paid by the vendor. All reconstruction of the property (new roof, new electrical wiring, new kitchen etc) will be done within 2-3 months, with a basic target of 2 months to reconstruct, and one month to let the property. But in any case, exactly three months after all funds have been received by the vendor, the rental period will formally begin. Then, on the 22nd of each month, the rental payment will made to the Buyer's bank. The rental payment will be guaranteed at 11%, that's $70,000 x 11% /12 = $641.67 per month. If the formal rental period starts between payment dates, then the first payment will be a partial payment. (Example: if the formal rental period begins 10 days before a payment date in a month of 31 days, then: $641.67 x 10/31= $206.99, for the first payment only. And $641.67 will be paid thereafter.) The Buyer is responsible for paying the income taxes on the income from the property. All other costs, including management fees, maintenance, local property taxes etc. will be covered by the Vendor. All rental payments are guaranteed by the Vendor's ABC Corp. The buyer will also have the right to sell the property back to the Vendor at exactly 100% of the original cost ($70,000) within the Buyback window ( which is the period 36 - 39? months after purchase. ) If the buyback is not exercised, then it will expire. And after the initial 3 year period, a new management contract will have to be negotiated, and the 11% guaranteed return will no longer apply. + Will the buyer see photos of the property Before and After construction? + What exactly is done during the Reconstruction period, and what benefits (like a Roof Gtee) might inure to the benefit of the property Buyer? + What happens if the tenant trashes the property? Who covers repairs? + What can we expect will happen to the terms of the mgmt contract after the 3rd year, if the property owner wants to renew it? + Can the property be sold before the 3 year gtee period ends? How would that sales transaction work (what fees to pay, etc)? + What percentage of properties does ABC expect to have a Shortfall-in-valuation at 3 years, that it will need to cover? How long does the Buyback agree allow ABC to cover any shortfalls? 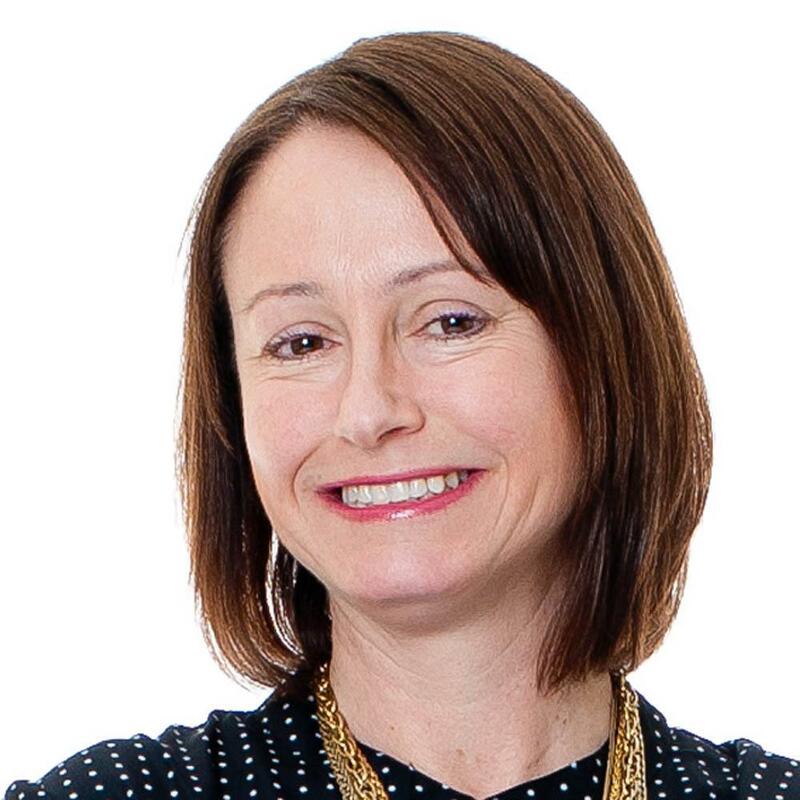 How does ABC Corp manage the risk of their being a much larger-than-expected number of shortfall properties? + What can be done to "target" neighborhoods with higher potential for price appreciation? Are there likely to be a "cluster" of properties available in the same neighborhood? + Does X-- think that banks might be willing to lend it several property owners submitted a loan request at the same time, so the total loan requirement was over $500k? (But with no cross guarantees) Who is ABC's bank? 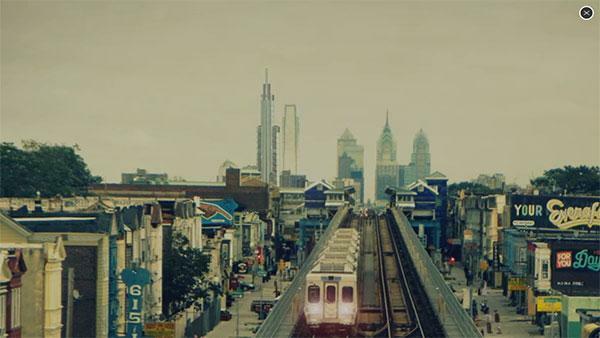 + Any new transport projects in Philly that might transform neighborhoods? Icon at 1616 Walnut St. in Center City. The apartment market in Center City continued to show signs of strength in 2014 but there are some indications that 2015 will be a telling year for the local multifamily sector as projects get completed and more units become available. In Center City, landlords of Class A apartments saw rents surge by 3.7 percent to $2,128 a month, or $2.23 a square foot, and the vacancy nudge up slightly to 5.7 percent from 5.5 percent. Though healthy, there are some cracks starting to appear. "The city's apartment market metrics continue to be affected by a rising tide of supply, especially in Center City," said a research report by Delta Associates that analyzed last year's Philadelphia multifamily market compared with 2013. "Vacancy experienced an uptick at year-end 2014 as more units delivered. On the other hand, this same increase in new Class A product, combined with the growing flight to quality, has helped bolster rent growth in the city. A more competitive landscape is expected in 2015 as pipeline developments come to fruition." By Delta's count, a total of 4,104 units are either under construction now or on the boards that could hit the market in the next three years and will translate into the vacancy rate rising and rent growth slowing. However, if current trends remain, in which Millennials and Empty Nesters continue to move to urban areas, companies add jobs and delays younger folks buying a house, then the additional units have the potential to be absorbed without wreaking havoc on the Philadelphia market. 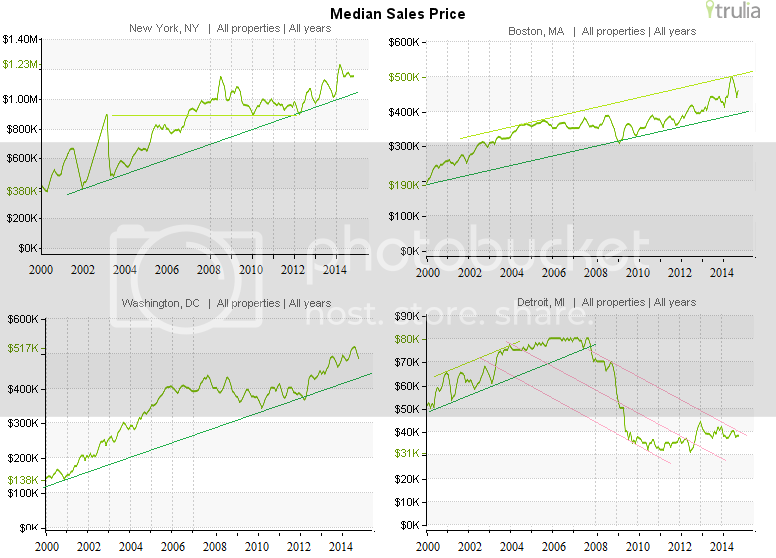 The analysis showed the suburban market also continued on an upswing and remains healthy. Rents went up by 3.4 percent to $1,458 a month, or $1.43 a square foot, and concessions have dried up. The vacancy rate declined to 4.4 percent compared with 5.6 percent in 2013. In recent months, four major new skyscrapers have been announced for Philadelphia — three in Center City and one in University City. Two more are already under construction in West Philadelphia. The new projects are a sign of renewed confidence on the part of developers, many of whose plans were put on hold or destroyed by the recession, though it remains to be seen if and when economic growth will return to poorer parts of the city. 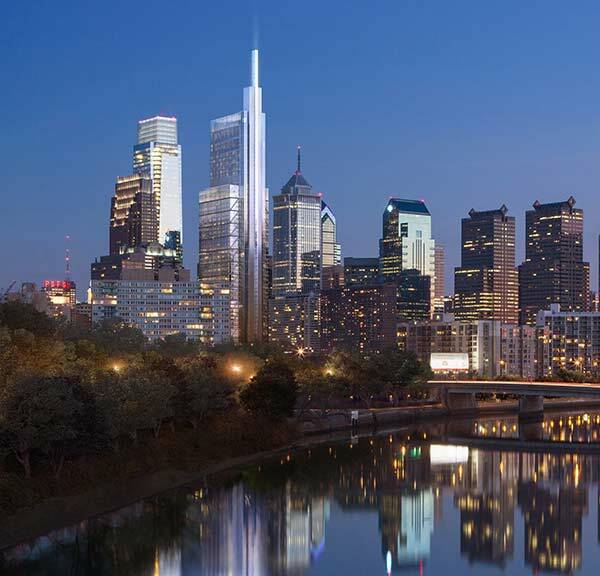 Comcast announced its plans for the tallest and most expensive of the towers, the Comcast Innovation and Technology Center, on January 15. Designed by the famed British architect Norman Foster, the 59-story, 1,211-foot tower will be by far the city’s tallest and the tallest in America outside of New York and Chicago. With a price tag of $1.2 billion, it will also be the largest private development in Pennsylvania’s history. Comcast completed its 975-foot headquarters building, currently the city’s tallest, just five years ago, but the company has already outgrown the building and currently rents space around Center City to house additional employees. The company will consolidate those employees to the new building, which will stand just a few hundred feet away from its headquarters. Comcast recently acquired NBC Universal, and plans to relocate the two TV stations it now owns in the region to the new building. It also says it will offer space in the building to local technology start-ups. 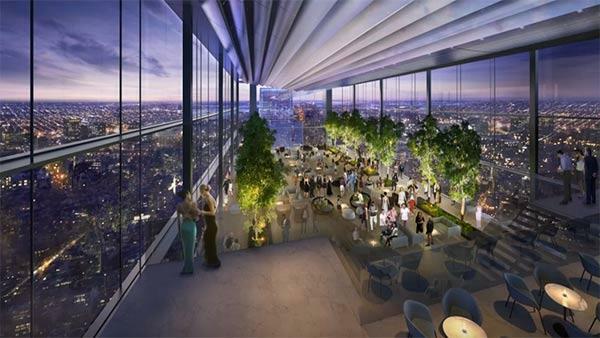 The top floors of the building will be dedicated to a relocated Four Seasons hotel. 2007 : Comcast Center -- : cc- SuburbanSta : 58st : 0,975 : 297m : 116,000 : Robt. Stern : 8,923 jobs? 2016 : FMC Twr/Circa CS : city-center ------- : 49st : 0,730 : 260m : 100k Est : ????????? : 7,800 jobs? 2017 : SLS International-- : cc- Broad St. ---- : 47st : 0,590 : 210m : 82. k Est : ????????? : 6,400 jobs? 2017 : W Hotel & Element : city-center ------- : 51st : 0,582 : 206m : 80. k Est : ????????? : 6,250 jobs? 2018 : Comcast I&T ctr.--- : city-center ------- : 59st : 1,211 : 430m : 145k Est : N. Foster-- : 11,000 jobs? Center City vacancy was 12.8% in early 2004, but a few years later, job growth took off. Comcast current office: 1 Comcast Ctr. - this is view from Cheltenham. The skyscraper has 1,238,000 square feet (115,000 m2) of rentable space, including 36,000 square feet (3,300 m2) of restaurant and retail space called The Market at the Comcast Center. 16,500 square feet (1,500 m2) of retail space is on the underground concourse while the rest is located on the street level. The building features high ceilings with some floors having a ceiling height of 13 feet (4.0 m). 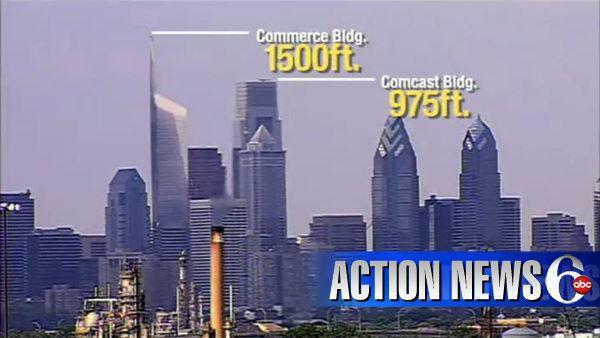 American Commerce Center (ACC) : 1210 feet, with a spire to 1500 ft. This is American Commerce Center. The vitals: 26 story hotel, 473' to the garden accessible to hotel guests. 3-to-6 stories of street-accessible retail along Arch Street with a public garden facing the dome of the Arch Street Presbyterian Church, and another garden on the sixth floor, between Arch and Cuthbert and overlooking the one below. 63 story office tower, 1,210' to the lower portion of the roof, 1,500' to the top of the spire. All parking is underground, including dedicated bicycle parking. LEED gold. 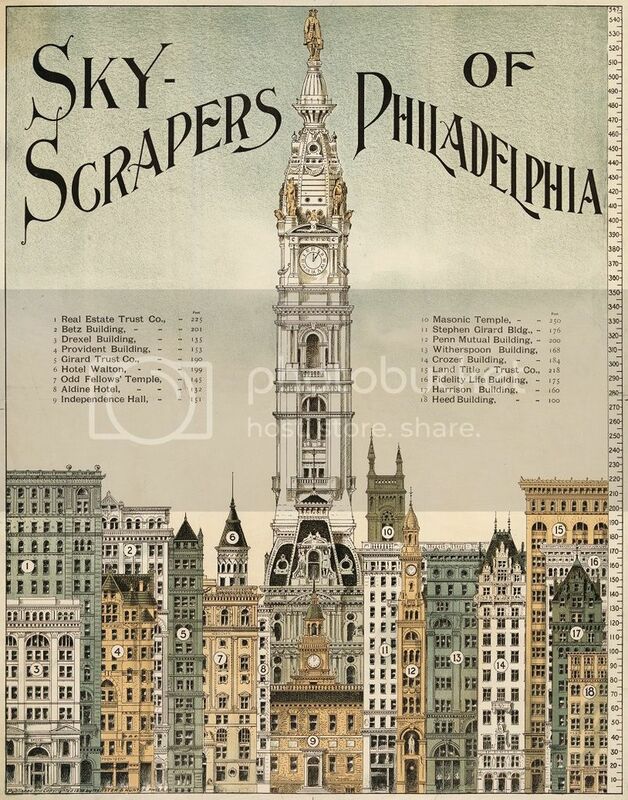 Mayor Michael Nutter, via his Press Secretary Doug Oliver, believes that "it would be a spectacular addition to Philadelphia's skyline. Sustainability efforts and building green continue to be hallmarks of this Administration and the plans for this particular project are consistent with those goals." If we've learned anything over the past five years of Philly's mini building boom, it's that the streetscape trumps all else when surveying a new building's contribution to the city. "We're still an affordable city for a millennial, where they can buy something for $200,000 to $450,000 right in the downtown neighborhoods of the city,"
Real estate in the City of Brotherly Love is on the mend. The last year brought more jobs and more home sales. From Comcast's expanded headquarters (parent of CNBC) to Tastykake's bakery, to new entrepreneurs, business is expanding in the city. Unemployment in Philadelphia is down to 5.8 percent in February, according to the U.S. Bureau of Labor Statistics. All of these factors have led to a boon in housing. Home sales increased 13 percent in the last year, reports Berkshire Hathaway HomeServices. "People want to be in the downtown area near restaurants, shopping, museums, the theaters, waterfront—from the millennials to the 55-to-75-year-old empty nesters," said Mike McCann, a real estate agent at Berkshire Hathaway Fox & Roach. Home prices have struggled, down 0.3 percent for all sales in the last year. If you exclude sales of distressed properties by short sales or after foreclosure, prices were up 5.5 percent, according to CoreLogic. 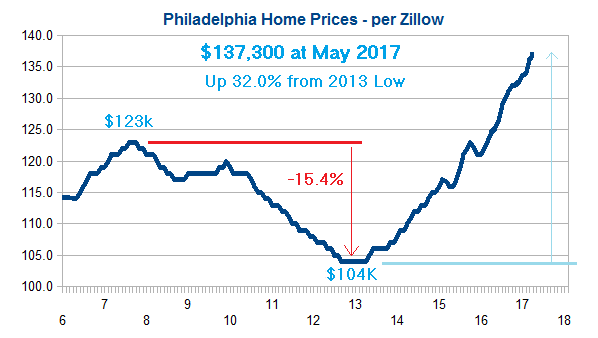 Fewer Philadelphians owe more on a mortgage that the home is worth. At the end of the fourth quarter, just 7 percent of homes were underwater, down from close to 10 percent the prior year. The city is looking to millennials for the future. The Philadelphia region is home to more than 300,000 students and many colleges and universities, including University of Pennsylvania, Drexel and Temple. The city has made a concerted effort to keep graduates in town. So they (eventually) look for a city the offers most of what they want, and they CAN still afford"
the "excess capacity" that exists in Philadelphia. Since then there has been real progress. Paseo Verde is a model Transit Oriented Development, located directly adjacent to the SEPTA Regional Rail Temple University Train Station. 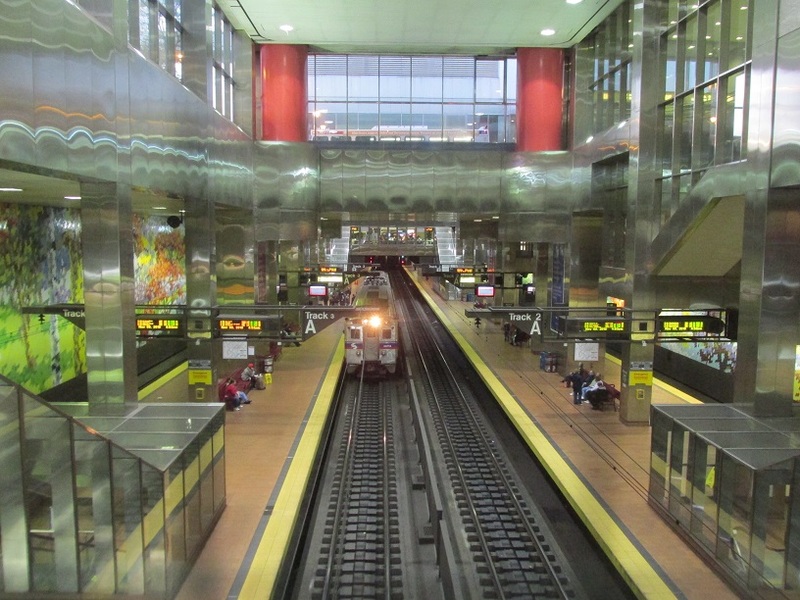 The station is the fourth busiest stop in the City, providing a 5 minute ride to Center City and connections to Philadelphia's regional stations. Paseo Verde consists of 67, one and two-bedroom apartments with a range of amenities such as off-street parking, fitness center, business center, community room, landscaped terraces, community garden, and ground-floor retail. Add to that an award-winning contemporary design, green technology and a happening Philadelphia location and you have the community of the future that you can live in right now! Andrés Duany, founding partner of urban planning firm, Duany Plater-Zyberk & Company, presents the General Theory of Urbanism at Hertfordshire, UK. Introduction by Lord Salisbury. This lecture remarks upon the extraordinary persistence of Howard's Garden City idea. After demonstrating how this idea contains the golden mean of all positive urban and rural traits, Andrés completes and updates Howard’s paradigm, and proposes its use in the planning profession as a Standard Model from which deviations are numerically measured. This paradigm is then tested on six diverse Hertfordshire communities, and finally applied in a case study of the transformation of Stevenage, with remarkable results. "We are not against Houses. but houses have to be attached to a system." "To accommodate cars, some planners made walking impossible"
"Empty nesters are moving back downtown, because they prefer walkable living"
The estimated cost of a car is $9,000 a year... We have been designing a country, where we must have a car, and so we cannot afford housing. For each car you do not buy, you can afford another $100,000 of housing." He drove in from the airport, and saw many suburban areas that are sliding... becoming future slums. But is it just too good to be true ?" Thanks to the recession there are some outstanding opportunities to buy property in the USA for a fraction of what it is worth. In fact, house prices in some areas are at their lowest since 1993. That's up to 70% below their peak. This means, for a low entry price you can earn rental returns of around 20% net, after all costs and fees. You can even find completely renovated, fully managed properties which are already tenanted. So you get paid from day one. What's more, experts predict that capital growth will be very strong over the next few years. 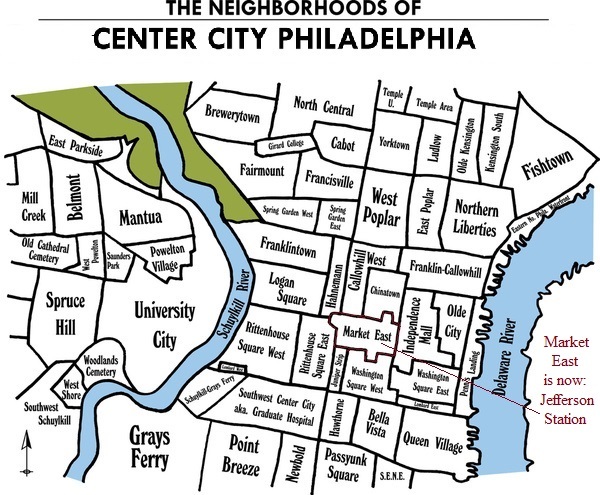 Do your other loyal readers a favor and tell them to stay out of center city Philly. during the weekend in a major center city hospital.